Any inquiries regarding incorrect charges on your bill and incorrect payment can be done by written form to CBN no later than 7 (seven) days since the due date as listed on monthly CBN Account Statement. If there is no objection within the designated period, then the bill and payment for that month is correct. Any inquiries regarding incorrect charges and incorrect payment will not be processed if it is not a mistake on CBN part. 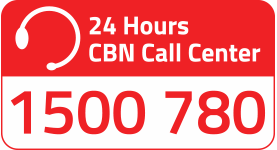 CBN Internet service is only provided for registered customer and any other party that has been given authority from the registered customer as written in registration form, at which the customer is fully responsible for their secrecy and use of service that is done under the username and password of each customer. Transfer fee and taxes of all Internet service fee will be charged on the customer, including other charges other than the Internet service fee. When the customer status is “active”, there is no need to send any proof of payment when paying via ATM and Internet Banking. You may change your payment method by sending us Payment Method Change Form. All changes on data and facility (including changes requested by customer) will be charged with administration fee in accordance with the regulations. Account freeze will be imposed when your billing payment remains unpaid and we had send an overdue reminder to your email. Your account will become active after all the unpaid bills has been fully paid. The confirmation for termination of service must be sent in written form by the end of billing month and no outstanding bills remain. CBN is not responsible for any overpaid refund due to incorrect payment done by the customer. The overpaid amount will be credited into your next month billing or can be transferred into other CBN customer’s account. Please fill in the Termination/Temporary Suspension of Service Form. Temporary suspension of service can be done for a maximum of 2 months starting from the temporary suspension date and there must be no outstanding bills remained. If the temporary suspension surpassed the appointed time period, then you have to re-register a new account. The temporary suspension of service can only be requested once a year for an active CBN account. Please fill in the Termination/Temporary Suspension of Service Form. All CBN announcement will announced via email. The email will be sent to your CBN registered email. CBN Financial Regulation written on CBN monthly billing applies for all payment methods. All regulations and policies set by CBN is subject to change without notice at any time and to be in effect starting from when they are announced by CBN. Please print and fill in the form according to your needs. You can fax the form and any other supporting documents to CBN office number where your account is registered. Information on CBN Offices can be viewed at CBN Member Center. Your payment status will be updated approximately 3 days (2 days for payment via ATM) since the payment has been made. You can check your payment status at CBN Member Center. Fill in your username and password, then choose “Payment Info” after you logged in. Any payment made during current month will appear on next month billing. You can check your internet usage status, whether in details or overall summary at CBN Member Center. Fill in your username and password, then choose “Billing Time” after you logged in. In the menu, you can choose “Current” (to check your current month usage) or “Previous” (to check your last month usage). Please note that CBN only store the data of customer's current month and previous month Internet usage status. This is applicable for all request methods (via walk in service, telephone, email and website). Your CBN monthly billing is subject to service tax following tax regulation in Indonesia. We will send your monthly billing via email and courier (hard copy) in between the 6th-10th and a payment reminder via email in between 14th-16th of the month. If by the 25th CBN has not received the payment, then we will freeze the account. Why my last month payment is not recorded on the next monthly billing? You have made the payment after the due date or in the next month. You have not made the first payment 7 days after your account has been activated. You have not made your monthly payment after the 25th (CBN payment due date) of the month. How to re-activate my account? Your account will be re-activated within 24 hours after the confirmation has been received by CBN. Please be noted that some Banks will send the information regarding your payment to CBN at H+1 after you have made the payment. Can I freeze my account temporarily? CBN will not apply the pro-rate system for payment regarding account freeze. If you freeze the account in the middle of the month, then you will still have to pay the full monthly payment. We advise you to send us the account freeze notice H-2 via email to sales@cbn.net.id before the month that you want to freeze to prevent being charged for that month. You will not be charged for invoice print fee Rp 5,500.00 after you have applied for e-billing. Billing information will be sent via email on 5th – 6th of the month. Stamp Duty will be charged on all CBN invoices in accordance to Law of The Republic of Indonesia Number 13 Year 1985.